If my blood tests are “normal” WHY do I still not feel my best? How can I really know if my supplements are working for me, and how can I know If I’m taking what I need? Is there a way to use lab work and other objective testing methods to know what supplements I need and if those brands are working for me? Are there ways to test for optimal health and not just the absence of disease? We may have the answers with the most comprehensive nutritional analysis available with:Science Based Nutrition, Health Based on Science – not hype. Our foundational program is composed of 2 separate analyses: a complete blood analysis and a hair analysis. 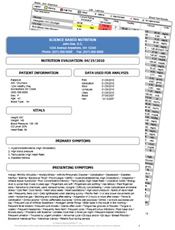 Our complete blood analysis is based on 7 profiles and is composed of 56 individual tests. Most routine testing usually only check for 20-30 possible abnormalities. This panel will identify you blood type, check your blood sugar levels, evaluate the function and health of your organs, evaluate thyroid function, measure total and individual cholesterol levels, evaluate your blood health, check for excessive iron storage in the body, detect and evaluate short term and chronic inflammation in the body, that may be linked to chronic diseases and infections, evaluate basic brain health, check your vitamin D levels (which affect thousands of bodily processes). Blood testing isn’t always an accurate indicator of mineral levels. Because optimal blood health is your body’s priority, in order to compensate for any mineral deficiency, your body will withdraw minerals from healthy tissue at their expense. For this reason we also include a hair analysis, along with our complete blood analysis. Not only do mineral levels found into the hair directly correlate with levels in your organs and tissues, a hair analysis will also reveal toxic minerals which may be interfering with the absorption and utilization of healthy minerals. Toxic minerals can also negatively impact your health in many ways.